Join us for an evening to remember. 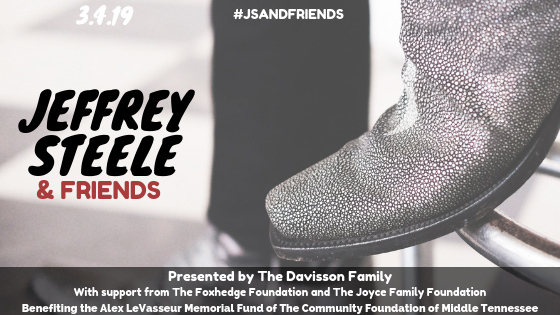 The Alex LeVasseur Memorial Fund presents the 12th Annual Jeffrey Steele & Friends, an intimate evening hosted by Storme Warren with special guest performances by: Jeffrey Steele, Steve Cropper, Eddie Montgomery, LOCASH, RaeLynn, Steve Dorff, Alissa Griffith, KASL, Travis Denning, Chris Janson, and more to be announced! Jeffrey Steele and family created the Alex LeVasseur Memorial Fund at The Community Foundation of Middle Tennessee after Steele’s 13-year-old son passed away January 28, 2007 in a tragic accident. Steele and his family are very involved with the program initiatives which support overlooked and at-risk youth in our community and beyond through programs, projects, and grants. Special VIP reception performance by Alissa Griffith. For VIP Seating and Sponsorship, click here. Admission to the balcony includes premier viewing and access to the private lounge. Presented by the Alex LeVasseur Memorial Fund of the Community Foundation of Middle Tennessee.